Spending the Holy Week in the Philippines can be a colorful and almost as festive as the major holidays in the country. Lenten traditions that have been passed from different generations are still practiced, making this season not just religious but culturally relevant as well. 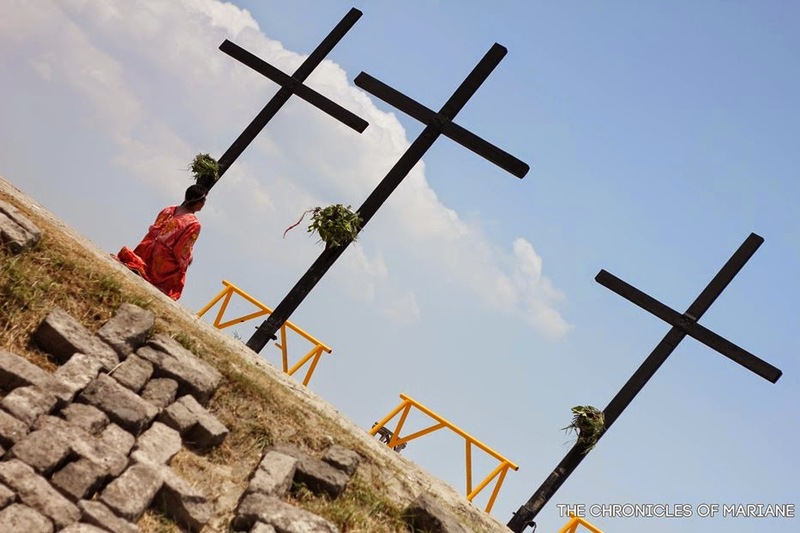 One province in the Philippines that surely has an interesting Easter tradition is Pampanga. 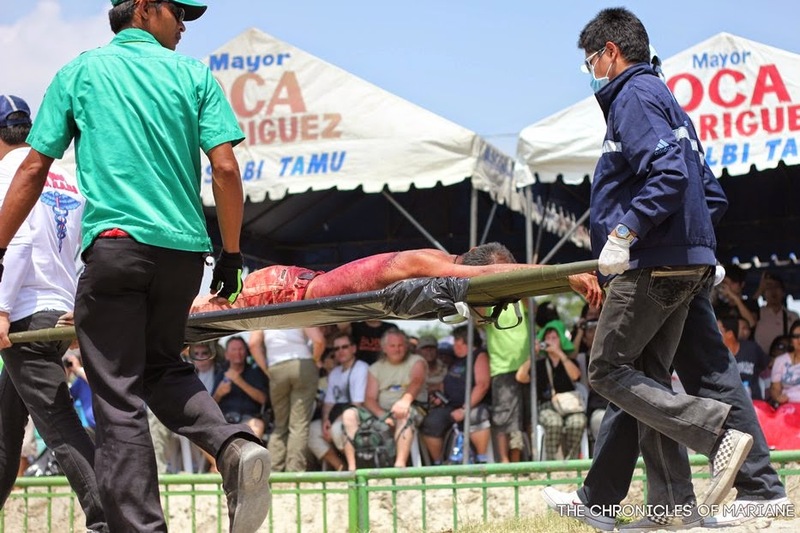 It annually gathers thousands of local and foreign tourists for an event that literally shows true Filipino sacrifice and "blood". 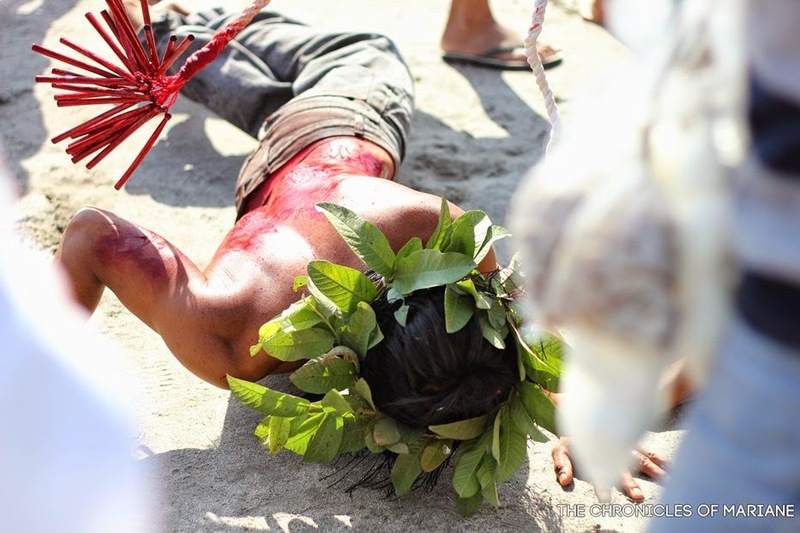 This is a famous sacred practice in the country that is mentioned in almost every travel guide about the Philippines. It was early Easter Friday of 2011 when I took my first solo out of town trip and photowalk out of Metro Manila. Armed only with my camera and 50mm prime lens, sunblock and umbrella, I was a bit hesitant since the thoughts of being lost and having my things stolen got stuck in my head. I can finally test if I am street-smart enough to do more travels on my own. I have successfully made my way to San Pedro Cutud on my own but afraid that I might have been overcharged tricycle fares. 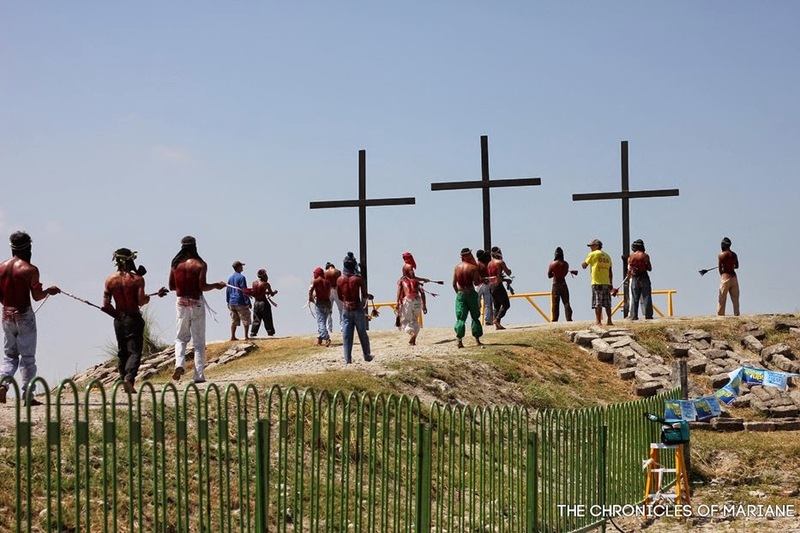 This town located just two miles of South Pampanga, is locally known for its yearly Lenten rite of performing a passion play of Jesus' suffering and death. 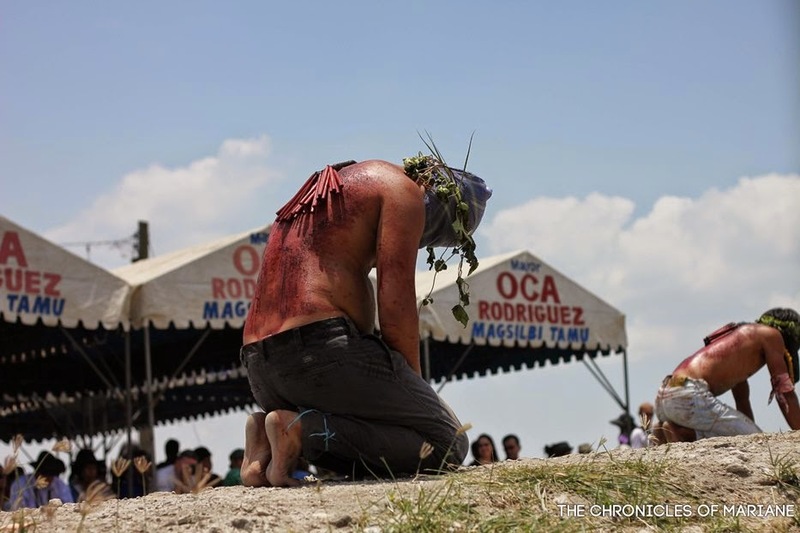 Every Good Friday, a great number of spectators flock the rice fields of San Pedro Cutud to witness flagellants and crucifixion acts done by penitents as an act of faith and repentance for the sins they have committed. 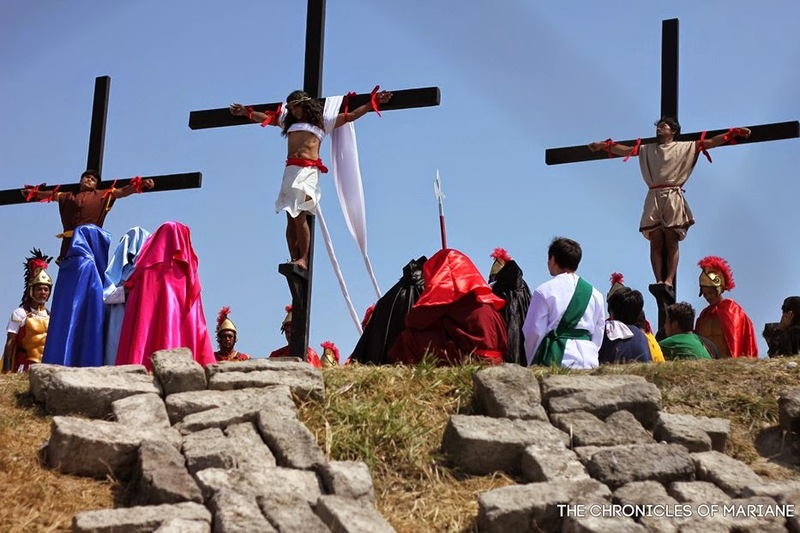 Following the biblical story of Jesus, the passion play is performed with the actual crucifixion involving three penitents that are to be nailed to a wooden cross atop a makeshift calvary. 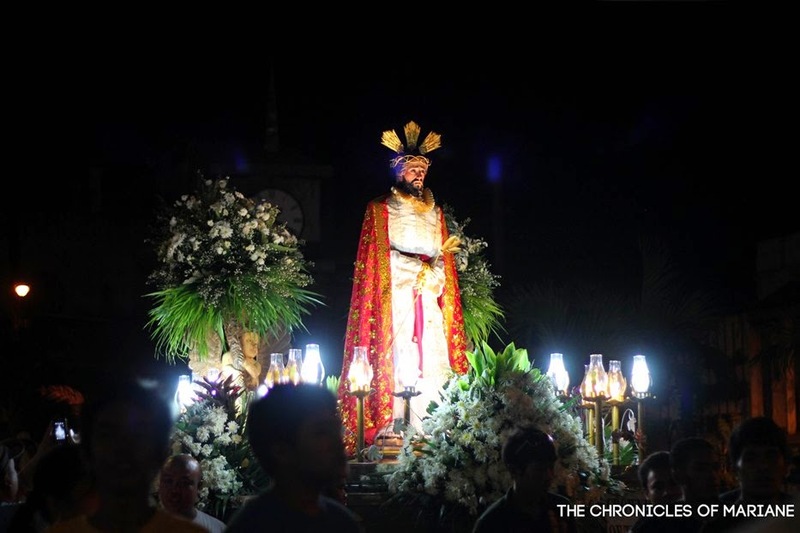 This Kapampangan tradition locally known as Via Crucis was initiated way back 1950s by Ricardo Navarro. 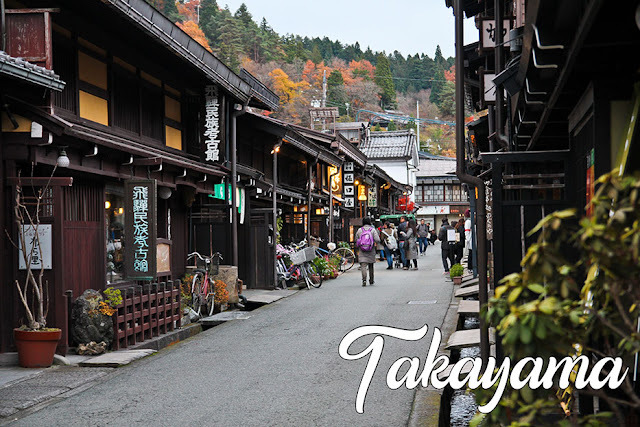 As soon as I arrived at the town proper, I was welcomed by the sight of a long line of bare-chested men with clothes covering their faces, makeshift crown of leaves and walking barefoot not minding the hot tarmac. They would whip their backs with every step that they make and it's quite impossible not to get tiny bits of blood splattered on your shirt. I soon learned from some friendly locals I met that the bamboo whip doesn't have any thorns to make the back bleed, but instead, someone would cut their backs with a razor or pieces of broken glass before the procession and the bamboos make the area swollen so it would hurt more once you whip it. Yikes. The flagellants have led me to the rice field where they make last rounds to the actual crucifixion site. It was only nine in the morning and yet the place is already packed with spectators, media and VIPs. I was told that the passion play will start by 1PM so I decided to take a quick breakfast first since it looks like I'd be needing more energy to stand all throughout this scorching hot summer day. The viewing area is divided into four sections. The VIP area dedicated for public officials and probably the rich members of the community, there was also a place dedicated for members of the media that is more closer to the crucifixion site, a larger unroofed viewing area for locals, and lastly of course, the Calvary which serves as the center stage. I was able to see different kinds of penitents, or as locals call it, the magdarame. 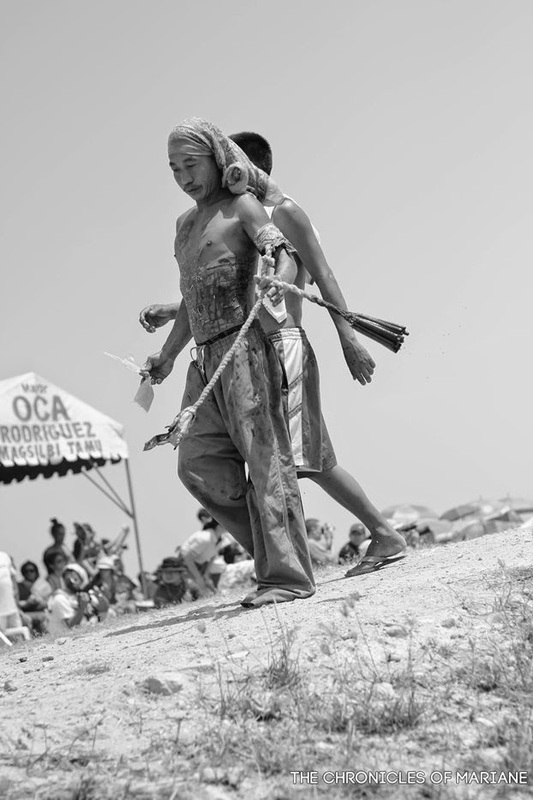 A large number of them were mamalaspas who practice self-flagellation or whipping their own backs. 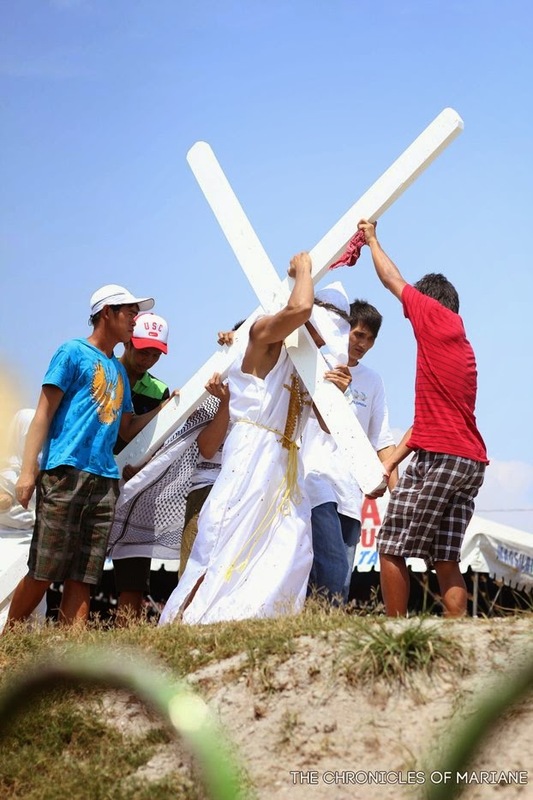 The mamasankrus who carry a heavy life-size wooden cross until they reach the crucifixion site. The very patient magsalibatbat endure the pain of crawling through the rough streets despite the heat and pain from their backs. And the people who actually get nailed to the cross, the kristos. 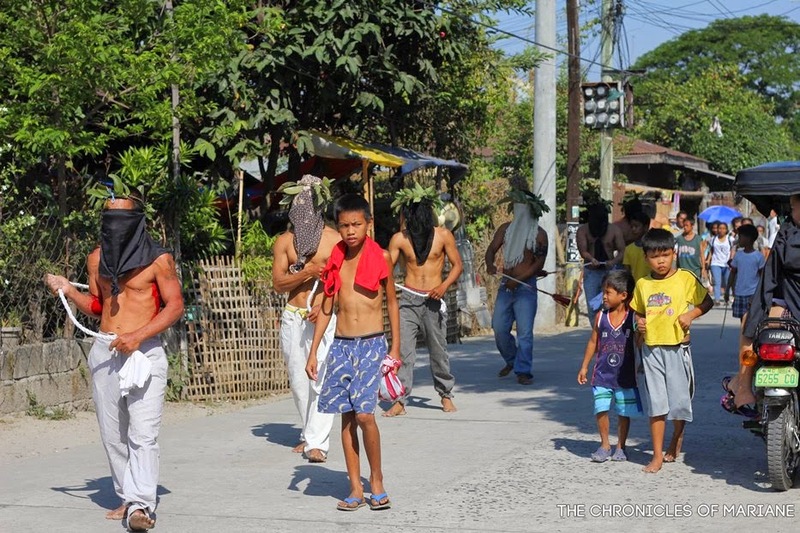 I have also learned that the flagellants have their own reasons for undergoing this ritual. Most of them do this as an act of repentance, some also practice this as a way of showing gratitude to the Lord for all the blessings they have received through the past year or asking for guidance and support to protect them from sickness or tragic events. The crowd grew in anticipation as dramatic music from the speakers blasted, signalling that the Via Crucis will finally start. The play was done in the Kapampangan dialect so I relied on my knowledge of the scenes from the Bible. As the climax draws in, the foreign media and photographers became unstoppable. They were just everywhere! There was a barricade protecting the penitents from the media but some of them found a way in, took their pictures and prepared their spots for what's about to come next. The actual crucifixion. I cannot believe I was actually seeing someone getting crucified. 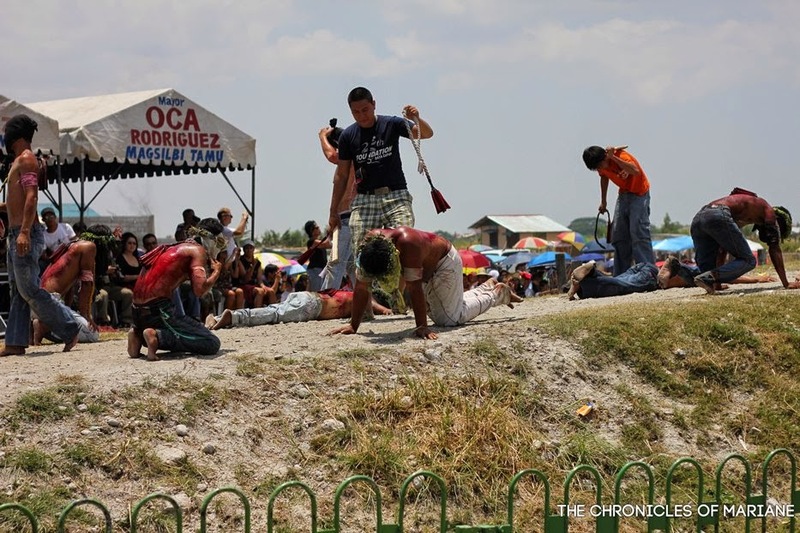 I cannot help but to feel pain as well when I hear the agonizing screams from the kristo when the nails were pierced through his hands and as the cross was slowly erected to the ground. He must have lasted around five to ten minutes before the medics rushed to him. Not everyone can tolerate that kind of excruciating pain. As soon as he was taken down, the crowds soon have also thinned out. I guess everyone was just waiting for this moment. By the time the ritual was finished, I was dead beat. I was probably under the sun for almost 7 hours. To some, the event left a bad taste and may have even looked like a circus (yes, I heard this from a Filipino who attended with me on the same day), but this made me more impressed by how strong the Filipino faith is. Even though I do not really approve of the acts, I still admired their strength and passion to sacrifice their health and body for a couple of days. 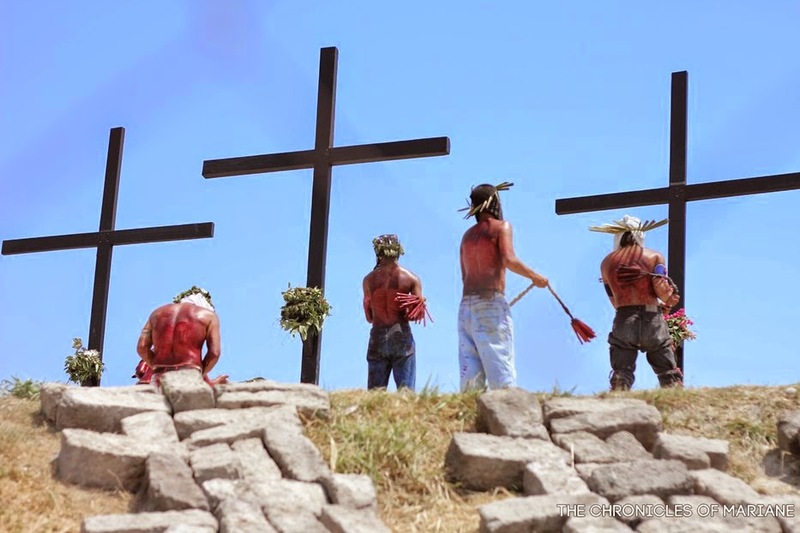 However since this is an act of penitence, I just hope that after Holy Week they will indeed change their ways and become a better version of themselves. Doing this ritual doesn't mean that you have a "safe card", I believe it is more important to learn from the life of Jesus and practice it on our daily lives.